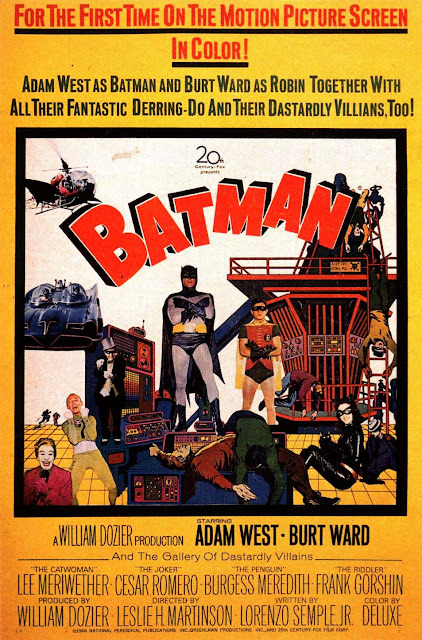 Batman (Adam West) and Robin (Burt Ward) face off against a team of super villains that includes The Joker (Cesar Romero), The Riddler (Frank Gorshin), The Penguin (Burgess Meredith), and Cat Woman (Lee Meriwether), who have joined forces to eliminate Batman and carry out an an attack on the United World Council. POW! WHAM! KA-BOOM! Holy movie review, Batman! 1966's "Batman: The Movie" was theatrically released between the first and second seasons of the "Batman" television series starring the same actors. Adam West, who rivals William Shatner in the use of the dramatic pause, stars as the titular caped crusader. West was not the first actor to portray Batman on screen, but his portrayal was probably the most memorable of the now Dark Knight. This film, much like the TV series, is a super campy adaptation of the comic book favorite. The acting is pretty damn bad, let us tell you. The bad acting is only rivaled by its laughable dialogue, silly costumers, and a story full of contrivances. "Batman" takes it so far, and is so over the top, and so self aware in how bad it is, that it actually make the entire thing less trainwreck-y and a much more enjoyable watch. Today, Batman is such a dark character, and we totally get it. If you don't want to see Batman running miles with a sizzling bomb, look elsewhere, such as the films of Tim Burton and Christopher Nolan. A version as ridiculously outlandish as this could never be made today without fans completely blowing a gasket, not to say someone didn't try because Joel Schumacher sure did with "Batman & Robin," and that movie wound up being an epic failure floptastic dingle berry on every level. This version manages to capture a certain magic that only existed in the 60's and encapsulate it for all of history. It's the film that allowed Cesar Romero, who plays the Joker, to keep his mustache intact and instead of shaving it off, was allowed to have it painted white to match the rest of his face. Burgess Meredith, who plays the Penguin, walks around squawking like a penguin, but winds up sounding more like a squealing pig and in an epic fashion. AND THE JOKES, good god, the jokes! Riddles are given such as "What has yellow skin and writes?" and the only logical conclusion to Robin is a "ball point banana!" as all of this is uttered as Robin holds a yellow pencil in his hand. This is no accident, folks, just utterly tongue-in-cheek and parody-esque. As much as we love this incarnation of "Batman," it serves to show there was a time in Hollywood when people couldn't really make superhero movies serious, well thought out films. It was almost required to be a parody of itself targeted directly at children. Oh, how far we have come. Despite all of the camp, which will isolate some viewers, the overall and clearly intentional low quality of script, the directing, and the effects add to its entertainment value, which is pretty damn high for us. It is a good time as long as you let it be and aren't looking to take it too seriously. It's light and fluffy, silly and spastic, and corny and campy. It's worth a watch at least once to see how far the character has come in cinema. One year ago, we were watching: "Wait Until Dark"